I will be missing my favorite April's Fools Day celebration in San Francisco this year: Saint Stupid Day parade. It's a decade long traditionally funny, amazing and provocative way to start the month and somehow to start the beginning of a new year of foolishness. Over and over again, celebrating human stupidity as a sort of enlightening religion. Sadly so, serious stupidity is both consciously and unconsciously practiced by many people of any age, gender, race and social status in our world. I don't even want to start listing how many stupid choices, so tragically, many of us do, unfortunately affecting every one else too. This practice is specially evident in this unbelievable historical moment, where our major leaders are leading us, successfully so, on a horribly sad and ruinous path. I am not home at the moment, I am in Asia. 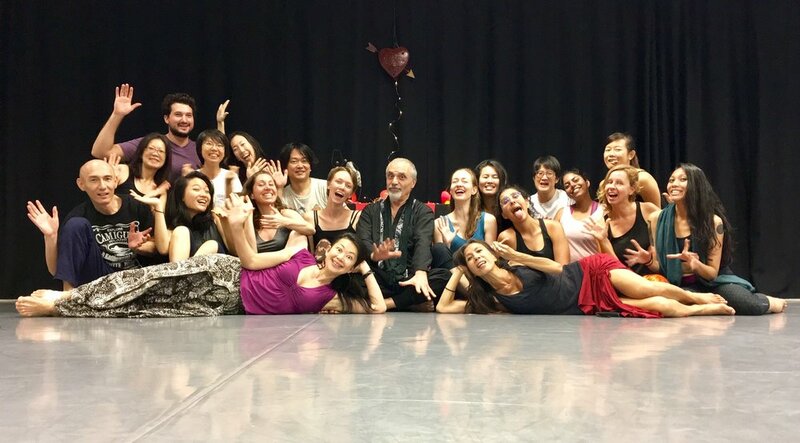 Ecstatically grateful to be invited to offer the 5Rhythms practice and hold space for a short but intense journey through the emotions offering here, in Singapore, my latest Heartbeat workshop, Heart Warrior. Very honored and delighted to be on the southern hemisphere, to explore and celebrate, together with this new tribe, the power of this practice that transformed my life. The power that this moving meditation has on the connection within ourselves and with others, discovering our own potential and supporting our personal growth in integrity with our personal truth. To find the out that we can change the perception of our existence and then, that ultimately it can be the very first step to contribute energetically and practically to a much necessary change for a world that is in need of compassion and justice, more than ever. In need of open minded, open-hearted people willing to support resolutely for the necessary changes of rules and regulations of stale old systems and beliefs that are taking all of us on a dark path of destruction. Moving Meditation for moving action, to stand proudly for equality, human rights respect and care for our environment. In this last three days, together with an amazing group of people coming from many different countries, speaking different languages and stepping into the path of the heart, I experienced the willingness and the power that comes from the unified field of our existence and that reveal itself so clearly when the conditions are present. So I dance proudly with this beautiful humans inspiring each other to step as peaceful warriors on the path to fight the greed, the shortsightedness and ultimately the stupidity generated by too many insane leaders and way too many brainwashed followers. I believe we can. Together. Step after step. Breath after breath. Moving toward the light. With Love. Last Fall I fell in love with my heart and many other hearts beating ardently in the chest of the delightful tribe of the Gorge in Oregon. Last month I embraced love in San Francisco and I was embraced by the bursting love of everyone in this home community, my family. And soon I will carry with me all of this emotional amazing support and powerful strength all the way to Asia, to Singapore, offering a weekend of what will be their first 5Rhythms Heartbeat workshop. As a paladin of the Heart Warrior I will be standing respectful and proud of the honor and the commitment I made to bring my offering to the world. It is such a gift to be able to share this practice to many in the four directions. I am ready to step together with all the hearts that I will be meeting over there, into the journey of the emotions. Feeling already the inspiration that comes from that land and the ancestors that populated myriad of islands, navigated perilous seas and witnessed in awe the power of tremendous volcanoes. The history of that is still there. Deep in the bones and in the soul of the people. It can’t be denied, it can’t be hidden, as much as it can’t be let out of control. It’s a deep warrior power that resides in the heart. It's not an easy and straight path. It takes time and courage, and openness. After many years of trials and errors, gurus and shamans meetings, explorations of many traditional and alternative directions, I am still learning. And, if nothing else, welcoming errors as another possible way to grow. Still learning how to give proper space and directions to all the responses that my body, mind and heart collect and process to transform my energy into action. Standing with the full energy of a peaceful warrior, with clear mind, strong heart and fluid body. The 5Rhythms is and has been my best map to step fully supported in all of this. Gabrielle Roth said: "The only way out is through". I would add: through it, over and over. Wave after wave. Breath after breath. Day after day. Life after life. And so here I am, bringing my contribution and my take to this celebration of Love. Love has been my mantra since long time ago. Not only the romantic love, that I enjoyed it and still do practice it very much, grateful to my adorable partner, but the one love that can be found in every instant of our existence. In every living being, flower, sound, color, poem, breath, song, dance and even in a grain of sand or a drop of rain. I believe in Love. It is the most powerful and transformational energy that humans can experience. It is our life force, we all have it inside us, and we can fully appreciate it by embracing all our emotions. Some of us might not see it, deny it, fear it, underestimate it, even reject it. That's when we would need to revisit our basic emotional map. To find out how powerful they are, how amazingly we can experience and relate to them, feeling, walking and dancing through them. Supported by the 5Rhythms practice and by activating dynamically the life force within us. Embrace Love is the upcoming Heartbeat workshop I will be offering in San Francisco on February 15-17, supported by The City Waves. Don't miss the opportunity to explore and embrace your emotions and to dance through them, to embrace your heart and the love that wants to flow through it. I’ll meet you there! "In Heartbeat we explore our emotions as energy, as power, as part of being human. Old feelings that have been locked in our limbs or caged in our chest begin to shake loose. We get comfortable with feelings, neither hanging onto them nor pushing them away. The Focus: the spontaneous heart. Love is, essentially, the primal energy of all our emotions flowing. Love is the healthy functioning of our whole emotional system. The expression and release of our true feelings constitute the essence of loving. Moving the body through the rhythms necessarily releases the emotions. Freeing the body leads inevitably to free the heart. Emotions need to flow like the blood circulating our body. Express the heart, free the emotions to experience the power of loving. Midnight. Always the instant where the day change. What is time anyway? Does time really exist? No matter on what numbers or definition of time we embrace, I can say that I personally experience beginning and ending, related to time. Over and over again. Year to year, month to month, day to day, season to season, full moon to new moon, sunrise to sunset, birth to death. So, let's agree that one "year" of our life has passed at midnight on December 31st. We experienced, in billion different ways, consciously or not, that passage from one year to another. That blink of an eye, instant of neutral suspension from the very official ending of 2018 to the very official beginning of 2019. One year has gone and another begins. What was gone with it? What will come after? We could meditate on the past and projecting into the future, creating more new year’s resolution. We could make a lists of success and failures, joys and sorrows, ups and downs. We could make plans and draw schedules and formulate proposition and intentions. I could, I should. I did. All good. All commendable. All essential and proper. But I also want to share how much I appreciated experiencing that blink of an eye in between years. That speckle of emptiness that is in between the in and the out breath. That invisible moment detached from the past and the future. It was invisible, odorless, immaterial. It was nothing. It was emptiness. I was in it for eternity and I went through it in a blink of an eye. I want to find it again into my dance, into my teaching, into my life. I want to live into that infinite nothingness and embrace all that comes with it and becoming fully aware that I'm in it. That I am it. Not only once a year. Not only at midnight. Always. Dance all of this with me, with us. Let words and thoughts and theories and concepts dissolve in the ether. Come as yourself and dance in emptiness, in eternity, in the present, embracing that invisible dynamic energy that keeps all of this in motion: Love. Embrace Love. Love for ourselves, for another, for the world, for our lives. May this new year bring inspiration and clarity for all of us. And may the dance of Love guide us toward the brightest Light. Happy 2019!!! The New Colossus is still standing, the lamp still burning. In the month of December, we somehow celebrate the birth of an ancient and famous refugee with words and decorations of Merriness, Love, and Compassion. Jesus and his parents were refugees. The nativity scene, depicts a family who were looking for a place to stay, only to be told there was no room for them. And so they encountered fear. Even being harmless they were inspiring fear. Fear of the "others" , fear of loosing jobs, security, having to share wealth and space. With "the others". And fear has been served in our relatively luscious lives. Daily. By the same civil servants that are elected to make sure that the very principles of our nation are respected. Fear of "the others". Fear is powerful. And can be used to manipulate entire countries into horrific actions. History is full of blatant journeys of escalations to dictatorship and destruction of human rights. Destruction of freedom. Fear. Going back to dark ages of empowerment of bigotry, racial and economic injustice and discrimination should generate fear. But that fear should also be transformed in courage and channeled into action. To keep going forward, step by step. Looking back and studying the mistakes of the past, with the full determination not to fall for that again. For our lives, for the lives to the ones after us. For a brighter, thriving future of the human race, for the planet. And winter solstice. Stillness. Let's dance through Fear. Let's dance Fear. Let's become aware of what's really a danger for the future. Let's celebrate compassion, courage and Love. Embrace Love! Together. No borders. No walls. Tomorrow, November 2 is the Day of the Dead. The day we all gather to honor our ancestors. To meditate and remember them. To ask for clarity on our path, strength on our decisions, for courage and support for our integrity. Our life, our existence, is the result of thousands of other humans before each of us that in many ways struggled, fight, cried, laughed and made love to each other so to continue our species and to persevere on an invisible journey toward a mysterious direction. Our struggles continue and we still are in many ways in a very primitive and savage phase as humans, sadly so in an otherwise amazing possibility to live in a glorious heaven, to all get along peacefully and enjoy this fabulous planet and the wonder of human intelligence. We all come from a long lineage of barbaric conflicts and cultures and some steps have been done to get in a true harmony with earth and with each other but in this moment it seems to me that we are actually slipping back into a dark and muddy slope. A tidal wave of stupidity and greed is looming at the horizon. So much we can do, so much we do so much we don't. One thing for sure I keep doing is dancing. Dancing helps our bodies, our minds and our hearts. It's a good medicine for solitude and for moments of hopelessness. It's a way to celebrate our life and our unity. Dancing is magic and invigorating. Transformational and supportive. Let's keep dancing, let's keep being together. Let's honor our lives and our ancestors. And on November 6 in the US, let's not give up our power. Let's go to vote for a better new world. We'll become one day the ancestors of this generation and we want to be celebrated by our survivors, in a better, more just and cleaner world, because we made a difference and believed in the possibility of true evolution. Let's be remembered as peaceful, strong warriors, paladin and dancers of Love. 'Fall In Love With Your Heart' was the title of my very first Heartbeat workshop I was honored to facilitate. And here, in the beautiful Columbia Gorge, surrounded by rivers, waterfalls, mountains, trees, colorful autumn leaves and together with other 44 amazing hearts I adventured in a three days journey through the 5Rhythms map of the emotions. And I, we, explored that empty space. We walked. We danced. We screamed. We cried. We laughed. We stepped in with our humbleness and vulnerability, showing ourselves openly and witnessing the others, with gratitude and full attention in a safe and welcoming space. Together. In sacred unity. Guided and supported by commune intents, reciprocal trust, deep respect and care for each and everyone's courageous heart that embarked in this journey. So I also did (again and again) fall in love with my heart. I did have the opportunity to offer my own vulnerability, my imperfection, my full presence and my learning. And to navigate through this map trusting my feet, my breath and the rhythm of my heart. How can one not fall in love with his/hers/their hearts? And be fascinated by it? And desiring to take good care of it? And be inspired. And feel. Feel. Feel. Feel. Everything. And that. Of course. It's just the first step in our conscious life's journey. Moving towards Love for another. Towards Love for All. Toward Spirit. Grateful for you all. Stepping forward. With more Love in my Heart. Ready to share it all. Again and again. On September 22, for one second, (exactly at 6:54pm) our planet's seasonal duality will be in perfect balance. Day and night will have the same length, the same value, the same influence on our astral system. Light and dark, yin and yang, masculine and feminine, giving and receiving, sweet and sour, good and bad. I see that as an instant of perfect stillness, in a perfect moment of exchange of giving and receiving. A stellar balance. Then again they will differ in time. In our northern hemisphere, we'll start slowly slowly, day by day, getting into shorter daylight, stepping into autumn. It's a traditional believe that light is celestial, positive, beneficial and associated with goodness. But I believe that darkness is not exactly the opposite. Darkness might induce fears for being associated with mystery and the unknown but it has immense value and ultimately it holds its own powerful radiance. In darkness we can find unexplored inspiration, peace and softness, as much as in light. Inspired Darkness. In darkness things might disappear but we can appreciate the surrounding favoring other senses, and actually it is only in the darkness that faint sparks of inner fire become visible. And if we could surrender and open ourselves to that, we could appreciate our internal sparks and see all the treasures hidden in our inner world. Discovering and receiving our hidden powerful inner strength and giving it out to others, can be done embracing darkness. And so it is Practicing Compassion. Starting from that instant where light and dark harmoniously dance together in Stillness. Still summer. Here. Still winter in the southern hemisphere. We will be jumping today, from long days to long nights, traveling, south of the equator. All the way to Peru. I am always amazed at how just in a few hours of flight we can change season, temperature, language, food, attitude and so on. A few years ago it took me a few months of daily riding to make it over there on my motorcycle, from San Francisco. I actually rode from Prudhoe Bay, Alaska to Tierra del Fuego, Argentina. And going through Peru was one of my favorite part of the trip and I really loved it. In a few days, Vehllia and I will be bringing our 5Rhythms teaching there, in a weekend workshop called Path to the Center | Camino al Centro. Honored to be invited and excited to bring our sacred offering in that consecrated and venerable land. North to South. In our Path to the Center. And of course bringing our ancestral connections from East and West. Path to the Center. Where the cardinal directions are just a way to embrace and to encompass the Universe all. The center is inside us. We are one with the Creation and with its mysterious immensity. I always loved the infinite sign: "∞". And I consider our universe, our existence and our spirit infinite. No defined beginning, ending, borders, no mine or yours and ultimately no explanation either. I love science, but I see the amazing discoveries we keep doing as a never-ending conversation that will in fact never end. So I prefer to dance. And our direction this time will be directly to the Center. To the Moving Center. To the discovery of our own truth. Through our movement. Connecting heart, mind, body and soul. To the Center. Then we will be back. And we will bring with us spiritual gifts and discoveries from that consecrated and venerable land. And once again we will be offering our practice in another workshop. Earth to Ether. Navigating through the elements. Culminating in a full moon ritual where we will be honoring the mystery, the wonder and the power of our natural existence. If you can't make it to Peru, join us for a post Peru workshop, in San Francisco on a full moon weekend. Promise it will be amazing! The month of July is here. Here in San Francisco, we even had a couple of weeks of real summer weather. Streets in the City are so much less crowded and quiet, it feels good. Noticing that the Sun light has that eerie familiar amber color. The haze and speckles of ashes from the many fires around us are filtering the air. Fire can get out of control and be devastating but fire can also be the force we need to forge metal, to warm us up in the cold of winter or when activated inside ourselves; in our moving center, it can give us strength to stand up to affirm ourselves, to make the first step for change, for renewal, for peace and for justice. And in these days, in this country, in this confusing social derailment we need to stand up for this principles more than ever. For the survival of this beautiful planet and her endangered nature, for the right of all people, all people, to have a free and dignified life. For the children to be with their families and to be taken care of, together, in unity. We don't want to see children in cages, we don't want to build walls anymore, dividing people. We need to build bridges. We can rebel, we can protest, we can march, we can write to our representatives and be creative and effective with our daily choices and actions. And yes, a lot of what we are seeing happening, outrage us, frighten us, sadden us and cause suffering. So here, once again, an inspiring quote from Gabrielle Roth. "Turn your Suffering into Art, turn you Art into Awareness and turn your Awareness into Action." Dancing is Art. Let's dance. Together. Rebelliously. Lovingly. Let your inner fire burst out in action! Everything started with my own birth, right where I am now, at this time of writing. Almost 68 years has passed and many stories I could tell. But today I want to honor and focus on the emotions side of my journey on the planet. And the full circle of this. In Italy we always favor the heart to the brain. And when we would get in trouble we would dive into it, totally heartfelt. So did my mother, an avid dancer; when, very young and full of Joy, became pregnant with me, making passionate love to an even younger man who’s Fear of commitment made him run away. And so she struggled with the Anger of her parents and the Sadness of being alone. But alone she was not, as I was there for her, all the way. Many times gifting her with the troubles that a rebellious wild son can bring, but also stepping in the role of father when necessary. And ultimately holding her hand through a long illness, all the way to her death bed, fully embracing Compassion and witnessing her last dance, stepping gracefully through the ultimate threshold. And now, coming out from an amazing deep journey of transformation on a roller coaster ride of emotions. Completing my 5Rhythms Heartbeat Teacher Training right on the day of the anniversary of my mother's departure. This completion followed by an opportunity to teach a 5Rhythms class, in my own town, in my native language, the language of the heart. Renewed and recharged, completing another full circle of giving and receiving. After the class, after the tears and the laughter, the drama and the quiet, I was invited to have a bite. And, they took me, without knowing where, right on the street were I was born. All around rubbles from WWII then, my childhood playground, gentrified nightlife hipster quarters now. Same food, my food, same wine, my wine. And then the T-shirt of our waiter got my attention. Another sign of my full circle journey! Bologna-San Francisco-the world in between-and more. More dance in Italy during my time here. Ending and starting again and again. Wave after Wave. Dancing with my Heartbeat more than ever. May 1st is also international day honoring workers and that is something that might be seen as too close to socialistic tendencies to have it moved officially to labor day. "Mayday" also is a code for request for help in distressed situations. Many meanings that I would actually condense together in a moment of communal reflection. It's great for our spirits and our bodies to tune with the change of the seasons. It's a wonderful moment to actually enjoy the nature around us, in this time of the year, in the northern hemisphere, when flowers are blooming and all the energy accumulated in the ground is bursting out with all the possible vital enthusiasm. It's very much a great day to honor all the honest hard workers in the world. And in particular to extend extra gratitude and to pledge support to the ones that perform the most humble tasks, at the lowest, and sometime unfair wages. And to send a Mayday to the Universe asking for a breath of sanity to refresh the heart and soul of so many individuals that have lost the memory of the concept of the unified field that has held us all together, animals, plants, elements. May we start re-thinking of the way we treat each other and the Planet. May we bring in way more compassion, respect and love for each other. May we really believe in peace. Words, words, words. I'll celebrate today with all of that in mind, now and I will be dancing and offering my heart to it. Would you join me? This time Vehllia and I are traveling in two very diverse places on this beautiful planet. I just came back from Lapland. We shared few hours together at home, a smile, a hug. Than she left and just landed in Peru'. 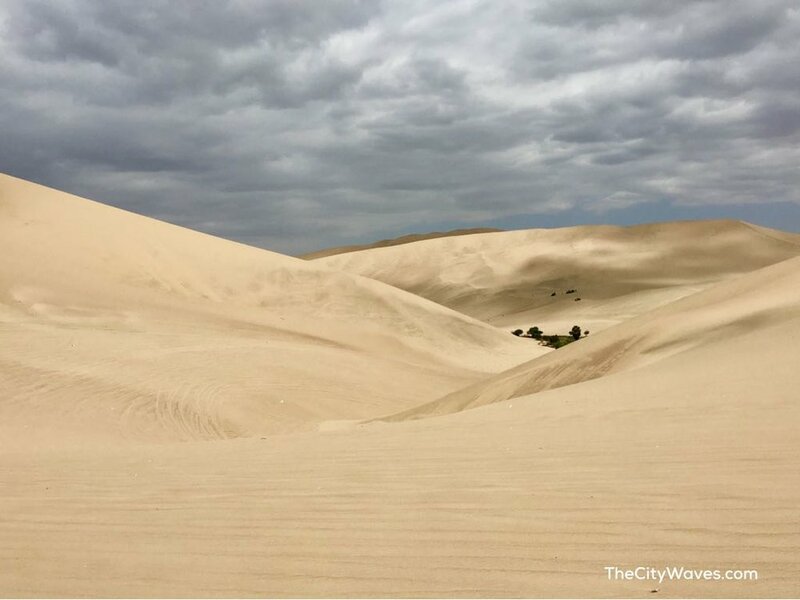 I was in dusty crystals of frozen snow, she is now in dusty hot sand dunes. Earth has ice and volcanoes, ocean and forest and all kind of diverse being on her, crawling walking, swimming and flying all over. And that makes her existence so perfect, so majestic, so mysterious. And so fragile too. How can we be so different, so distant and yet so connected? It's a matter of fact that we it can't be otherwise. Everything is connected to each other exactly because of the extreme differences. And seeing and honoring this connection and this interdependence is the key for the survival of this amazing life we all have. We need the ice of the poles, the deserts, the forest and the ocean, we need clean air and clear water and we need to respect and preserve the balance of all of that. We need to respect what is distant and different. We need to feel the connection with it. We need to respect humans that are distant and different. We need to feel the connection with them. We need to Love the other. We need to feel the connection. So easy to make things appear different from reality. Our egg shaped moon is funny and harmless and nobody would believe it for a second. But it's so easy to spread foolish, deviant, fake news, images and ideas to millions of people. And so much of this is happening these days. So much damage is done by so many ruthless humans in search of power and control for whatever reason. It's an ancient practice. Kings, priests, historians and charlatans have done and still do this for centuries and have created religions, believes, rules of laws and theories that unfortunately are still endangering the progress of human evolution, the society, our relationships. Fortunately there are ways to experience how to be together and be ourselves without the need to appear different or to create any type of image. And our way to do that is dancing together regularly and holding a safe space where we can be true to ourselves. To create a space and time together where spontaneity and sincerity are all what count, and being who we really are is the first step to clarity, empowerment and freedom. To be ourselves, to renew, to grow stronger and to make a difference in this foolish world. Monday is our day off. Usually but not always. Last Monday Vehllia and I drove up to Mount Tamalpais, hiking through the Cataract Trail. Boots, a light backpack, some water some snacks. Big smiles. Breathing. In 5 hours of hiking we met maybe a total of a dozen of people. A glance, a nod and so much silent respect for the communal desire to be out there in sacred land, mother nature. Away from our amazing and over complicated and complacent civilization. And for a long time all we were hearing was the sound of the water. Sometime very subtle and soft, sometime quite roaring and strong. A delightful nature recharge, less than one hour from our City turf. What a blessed place we live in. So much overwhelming abundance of everything and then the abundance of simplicity. I believe in the power of it. What's more simple than water and gravity? What's more simple than clouds carrying soft rain landing on meadows and trees, forming thousand of gargling rivulets of water converging in serpentine paths to form a creek. Then running faster in steep terrain and falling and falling, dancing on the rocks, washing away dirt, old leaves. To finally slow down to a rest in the lake, where the reflection of trees and clouds finds its perfect counterpart. I see the map of our 5Rhythms Wave in it. Once again, a natural and simple sequence of rhythms and energies. I recognize the power of the Simplicity of our practice. And I bath in it, I breath it, I renew myself. Over and over. Just like rain and waterfalls.